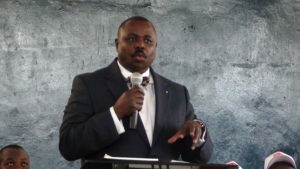 Deputy Speaker Jacob Oulanya speaking during a past event. PML Daily photo. KAMPALA–The Deputy Speaker of Parliament Jacob Oulanyah has adjourned Parliament business till next Tuesday when the bill seeking to amend Article 102 (b) is expected to be tabled. Oulanyah told a highly charged House that said the bill will be handled by the respective organs and will be brought back to Parliament at an appropriate time. He added that there are two main challenges in the House, which he identified as MPs not willing to sit and the Speaker not willing to chair the MPs who are not willing to sit. Earlier, Hon Odonga Otto had raised a motion requesting the House to send Hon Evelyn Anita to the disciplinary committee for displaying the list of the committee sittings to the press as the list of MPs supporting the motion, something that has caused public hatred for the members. He requested that Anite apologises to the Houses and be suspended for eight years from Parliament, a suggestion that was rejected on grounds that the House had less than four years left and had no power to suspend for eight years. He advised that the motion be brought back in the appropriate format.